← How far does True North deviate from Magnetic North? About five months ago, physicists at CERN released astonishing news: An experiment which involved firing a beam of neutrinos from the Large Hadron Collider in Switzerland at a neutrino detector in Italy found that the neutrino’s had travelled very slightly faster than the speed of light. This was absolutely huge news, since one of the central tenets of Einstein’s theory of special relativity is that the speed of light in a vacuum is a constant, and represents the absolute maximum possible speed that can exist in our universe. Recent rumours on a CERN internal blog suggest that a faulty cable may have induced a timing error which correlates exactly with the discrepancy between the measured speed and the speed of light. The actual announcement which followed shortly after is, naturally, a little less conclusive, merely suggesting two issues which have been identified which may have contributed to error, and that these items will be tested in the next experiment in June. The original experimental results, if verified, would represent the first crack in Einstein’s theories which had up till then survived every single test in almost one hundred years. Science demands that any claim must be tested experimentally, and a claim as huge as this attracted a great deal of physicists ready to give it a go. 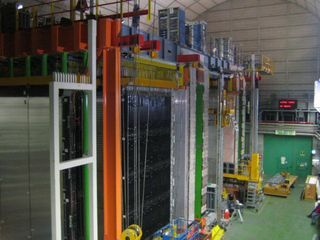 Unfortunately, neutrinos generators are hard to come by (This particular unit is part of the Large Hadron Collider), so nobody else can even attempt to repeat the experiment. Fortunately, the physicists who announced the experiment are good scientists who are rightfully skeptical of their own results and have publically called for suggestions as to where they might have erred, and have been working through the many suggestions. They have now identified two faults in their equipment which could have affected the readings: A bad fibre-optic cable, which would cause small delays in signal transmission, and a bad crystal in a timing circuit. These issues have both been dealt with, and another run is scheduled for June, which will confirm just how much of a discrepancy was introduced. As mentioned in my previous write-up (and many other places), we have at least one prior set of data which would prove that neutrino’s travel slower than light, and not faster: The supernova in the Large Magellanic Cloud of 1987 (SN1987a) released a powerful burst of neutrinos, which were detected on Earth a short period after the light from the explosion first reached Earth. If the speeds reported by last year’s experiment were accurate, then we would have expected SN1987a’s neutrino burst to arrive a full four years before the light arrived (It is several hundred thousand light years distant). Whatever June’s experiment reveals, scientists will be very excited. If the measurement was inaccurate after all, then we will have proved, yet again and with even greated certainty, that Einstein was right, and the physicists at CERN will have learned even more about the proper running of such cutting edge and massive experiments. But if the speed discrepancy doesn’t go away, and we continue to find neutrino’s travelling faster than light, then an entire new chapter of science will have begun in which physics prepares to take the next great conceptual leap.